SEATTLE--(BUSINESS WIRE)--Sep. 27, 2017-- (NASDAQ:AMZN)—Today, Amazon announced Echo Spot, the newest addition to the Echo family. Echo Spot delivers everything you love about Alexa with a smaller design and the added convenience of a circular screen so that Alexa can show you things. The all-new Echo Spot is $129.99 and is available for pre-order at www.amazon.com/echospot. It will begin shipping in December. Echo Spot fits easily into any room of your home. 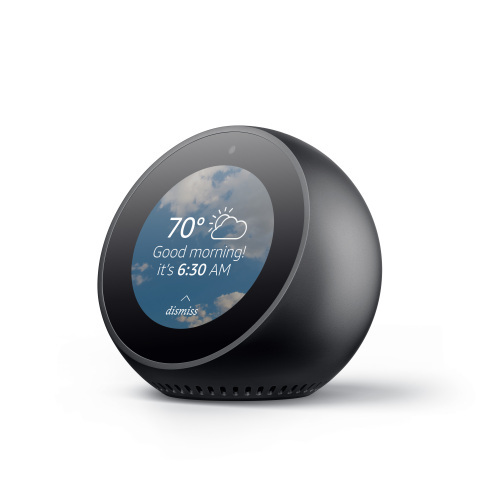 The size and viewing angle of the screen make Echo Spot ideal for use on a nightstand or desk as a smart alarm clock that can also turn your lights on and off, watch a video flash briefing, show your commute time, get the weather, or show your calendar. Or use Echo Spot in the kitchen to easily set and view timers, call friends and family, see shopping and to do lists, and more. Echo Spot features second generation far-field technology with four microphones, acoustic beam-forming technology, and enhanced noise cancellation so it can hear you from across the room—even while music is playing. If you have more than one Echo, Alexa responds intelligently from the Echo you’re closest to with ESP (Echo Spatial Perception). Alexa can talk to you and play music directly on Echo Spot through the built-in 2W speaker. Echo Spot can directly connect to speakers through Bluetooth or using a 3.5mm stereo cable, enabling you to add Alexa to your home entertainment system. Then, use just your voice to control Amazon Music, Prime Music, Pandora, Spotify, iHeartRadio, TuneIn, and more. Plus, with the new multi-room music feature, you can play your favorites throughout your home, with synchronized music across all of your Echo devices. Echo Spot integrates all of the smart home capabilities that customers love about Alexa—turn on the lights, view your live camera feed from the nursery, set up Routines, control the temperature, lock your doors with your voice when you’re heading to bed, and more. The all-new Echo Spot is available in black and white for $129.99 and will start shipping in the US this December. You can pre-order starting today at www.amazon.com/echospot. Echo Spot will be available in the UK and Germany early next year. Today, Amazon also introduced the all-new Echo with improved sound and a new design for just $99.99; the all-new Echo Plus with a built-in smart home hub for $149.99; and the all-new Amazon Fire TV with 4K and HDR for just $69.99.